You or someone close to you has been diagnosed with a peanut allergy. If you’re scared, that’s understandable. Peanut allergies are serious trouble. Peanuts cause more cases of the life-threatening form of allergic reaction called anaphylaxis each year than any other food. As little as one one hundredth of one peanut can cause a serious allergic reaction. And peanuts and peanut residue can lurk anywhere. Things you once loved– ice cream shops, birthday cakes, flower gardens, petting zoos, children’s playgrounds– even a kiss– can all pose a danger. But it’s going to be okay. Don’t panic! All right, actually, maybe it’s entirely justified for you to panic just a little. Go ahead. I’ll give you . . . five minutes. Go. I’m timing you, you know. That’s it, now. Stop. Pull yourself together! It’s time to take action. You can handle this. Even if you think you can’t. How do I know? Because I didn’t think I could handle it either. And yet, here I am. It’s been several years now since my son was diagnosed with a life-threatening peanut allergy in 2010 at the age of five, and as it turns out, he and I are both still alive. 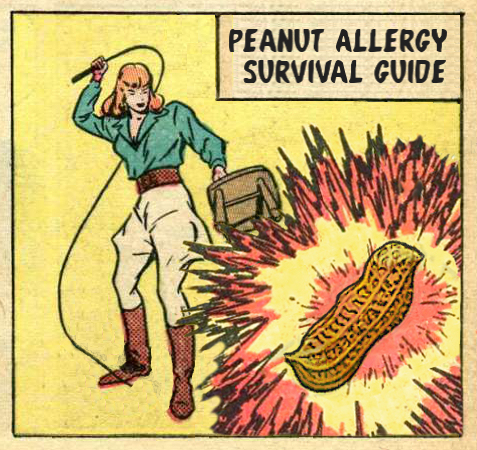 This is my (totally un-medically-professional) real world, road-tested advice on how to survive when peanuts attack. Step Zero: Consult a board-certified allergist. If you have not already done this, I suggest you make it happen ASAP. You may have already heard the dreaded official diagnosis from a family doctor, a pediatrician, or an emergency room nurse. And I am not here to tell you that those sorts of people do not know how to do their jobs. But those people’s jobs are not to treat food allergies. They practice general medicine. If you want the best care for a life-altering, potentially life-threatening condition, you need to see a specialist. Think about it: if you needed heart surgery, would you ask your family doctor to do it? No. You would see a heart surgeon. If you had cancer, you would see an oncologist. If you have a potentially life-threatening allergy, you should see an allergist. An allergist will be equipped to do thorough food allergy testing. An allergist will be up-to-date on the latest food allergy treatment research. An allergist will be accustomed to training patients in how to modify their diets and manage their allergy medications. So if you haven’t seen an allergist yet, STOP– PAY ATTENTION: DO NOT TAKE MY ADVICE INSTEAD OF A DOCTOR’S. I’m not an allergist! Go see one. Get some professional advice. And then come back and read the rest of this. Step One: Educate yourself and your family on basic peanut allergy facts. I’ve collected a whole page full of peanut allergy facts for you right here, complete with links to trustworthy sources with more detailed information. If you’d rather consult directly with the professionals, other good places to read up on basic peanut allergy facts include the Mayo Clinic and Food Allergy Research and Education. Chapter One: How to recognize and treat anaphylaxis. Chapter Two: How to read food labels for allergens and check products for cross-contamination. Chapter Three: How to create a peanut-safe environment at home.